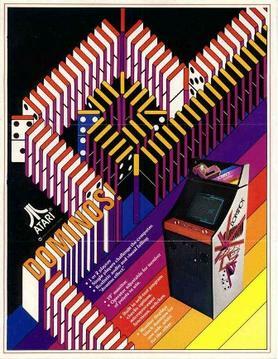 The Atari "Domino Effect": Higher earnings! All new Dominos pits one or two players against one another in a head-to-head battle of wits and strategy. Players control the direction of a simulated wall of dominos with a set of 4 instant-response push-buttons. Each player's wall starts out in one direction at opposite sides of the screen. The player progressively builds his wall by pushing the appropriate button (left, right, up or down) for the desired direction. The speed of play increses as the action progresses, adding to the challenge. A black domino set for one side, a white for the other reduces the possibility of a player watching the wrong wall. The object is to trap your opponent into running into your wall or his own. Precise timing and planning your moves in advance are the keys to winning. Dominos "fall" when opponent's wall is hit or player bumps into his own wall.